U.S. veterans ride their mountain bikes during a Ride 2 Recovery program Feb. 2, 2016, at Blue Diamond, Nev. R2R is a veteran program that saves lives by restoring hope and purpose by reaching out to veterans through cycling as a therapy for injuries, post-traumatic stress disorder, traumatic brain injuries and creates a family for them to be a part of again. 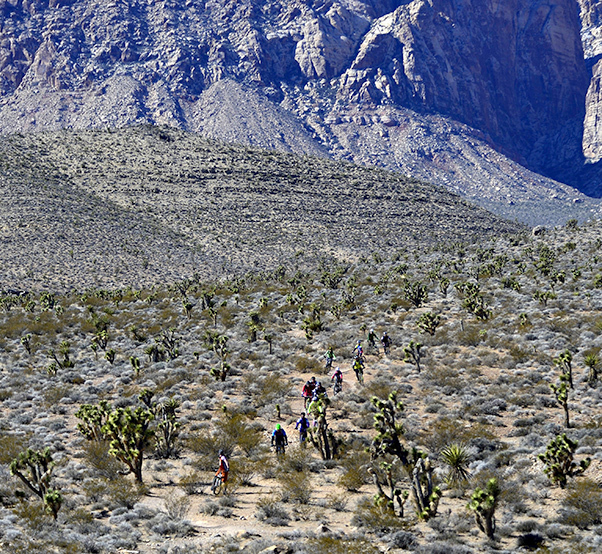 The challenge provided wounded veterans the opportunity to come together with others battling some form of injury. 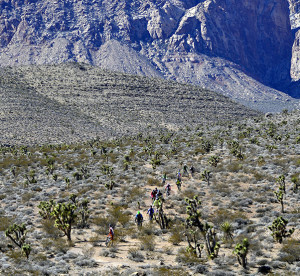 Nestled in the rocky mountainous terrain of the Nevada desert, the veterans biked for more than 20 miles over a three-day span for team building, confidence boosting and physical therapy. Paul, a 799th Security Forces Squadron resource adviser, is a representative for Project Hero, which is a local chapter of the R2R providing daily interaction and training with the veterans. He said seeing the change in the veterans after participating in the events is amazing. Paul said the program is responsible for helping veterans return to normal lives including socializing and physical fitness. For Paul, helping other veterans has also aided him in healing his own injuries, but he said being part of the program is his duty. For one remotely piloted aircraft enterprise airman, the program has helped him in ways he didn’t know possible. White was diagnosed with Parkinson’s disease in 2011. The disease is an incurable neurodegenerative disorder and causes tremors, slowed movement, rigid muscles, impaired posture and balance, loss of automatic movements, speech changes, and writing changes due to a loss of dopamine in the brain. 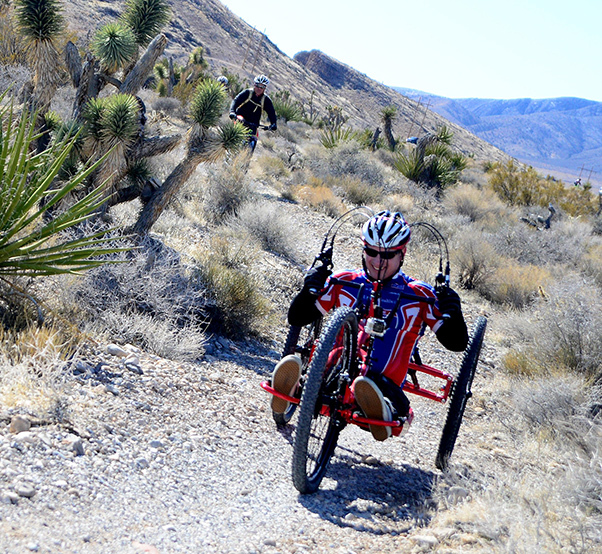 A recovering U.S. veteran rides his custom mountain bike as part of a Ride 2 Recovery program event Feb. 2, 2016, at Blue Diamond, Nev. The program is dedicated to helping wounded and recovering veterans by bringing the veterans together to lift their spirits and even provide custom made bikes for the disabled free of charge. White served 18 years in the Air Force, first as an F-16 Fighting Falcon crew chief, and finished his career as a maintenance production superintendent for the MQ-9 Reaper at Holloman AFB, N.M. While serving at Holloman, White spent time at Creech AFB to gain experience on the MQ-9 Reaper for a new squadron being stood up. During this time, he began to develop his Parkinson’s disease. Because of the high stress situation of working 16-hour days as the only production superintendent at a new base, White was pushed to a breaking point and was forced to face reality. “Needless to say, there was a moment when I had my clipboard in one hand and radio in the other, crying on the flight line and I had to go to my commander … for the first time in my career I had to admit that I couldn’t do it anymore,” he said. It was at this point that White began the medical board process. The Air Force granted White with the equivalent of a 30-year retirement and paid for his deep brain stimuli surgery, a procedure used to treat disabling neurological symptoms by blocking electrical signals from the areas in the brain that cause them. For White, even walking or sitting still seems an incredible challenge, but the bike is his sanctuary. When he rides, his symptoms dissolve as if he doesn’t have the disease. This is true for nearly all the riders despite their ailments. Even though White was a mountain biker for decades before his disease, he bikes today as part of his therapy to keep his muscles from becoming too stiff. He may not be able to set goals as high as he used to, but said he is thankful that he can still use his hobby as an escape. “I always tell everyone that if I could ride my bike through life, Parkinson’s would have no hold on me,” he said. White also said that even though the physical challenges can be difficult, they are easy compared to the mental challenges. Most veterans knew a life before their injuries, making readjusting to life difficult for them. U.S. veterans participating in a Ride 2 Recovery program enjoy a laugh before starting a mountain bike ride Feb. 2, 2016, at Blue Diamond, Nev. 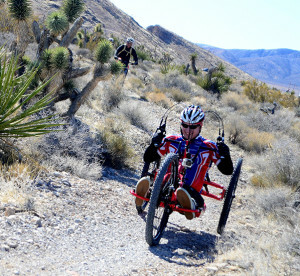 The program is dedicated to helping wounded and recovering veterans recover from injuries sustained during their military service through biking. The opportunity to come and train together distracts the veterans from their struggles and allows them to open up with others. Even though the veterans are recovering in one way or another, they are all unique. It’s a challenge to get every veteran back on the bike due to their distinct ailments, but the program is committed to getting everyone riding again no matter what. Because every veteran’s injury is different, the R2R program has mechanics that can make custom bikes so each and every one can ride no matter what their condition. 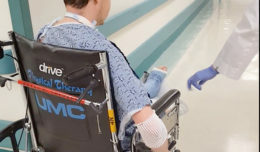 After a new rider sits down with the mechanic, countless hours are spent figuring out how to best suit the veteran despite their injury. Once a bike has been fabricated, it is donated to the veteran for free. The R2R which is made possible by its volunteers and support is able to build and donate custom bikes and in some cases even provide free transportation to events and meals. Editor’s note: One of the last names in this story has been removed for security reasons.